Welcome to the second instalment of my three-part series on the aphid, ant, ladybird relationship. If you don’t like ants, look away now! 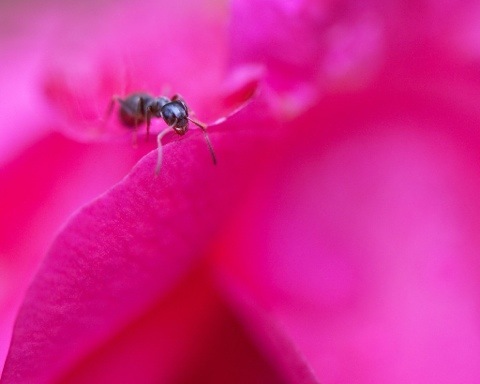 Less than .5% of the world’s species of ant live in the UK. It is mostly too cold and wet for them, something not difficult to believe given the spring we’re having! By far the most common is the black garden ant, Lasius Niger. 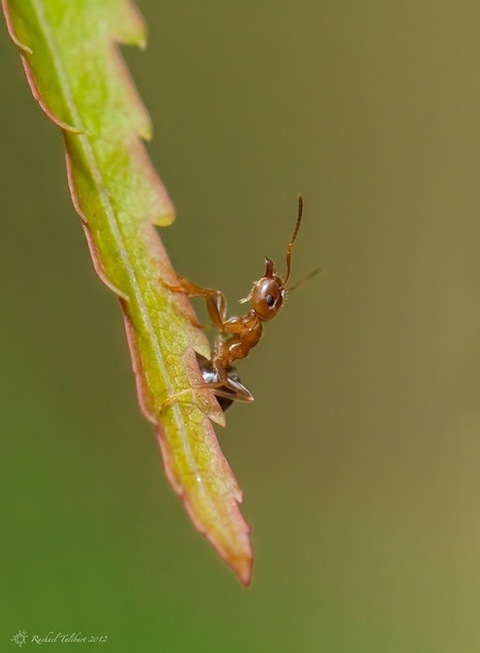 These tough, fast, little ants live in colonies of up to 15,000. They eat insects, seeds, nectar and even the bodies of their own dead. 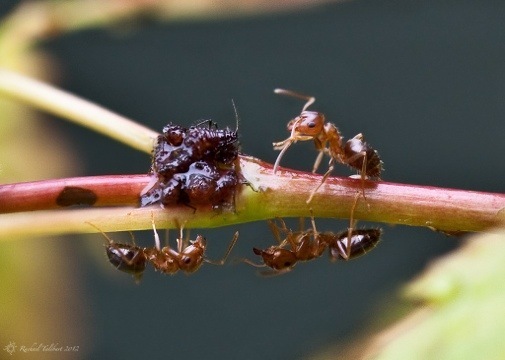 As illustrated in an earlier post, they have a particular liking for the sticky honeydew secreted by aphids and will climb bushes to “herd” aphids, protecting them from predators. 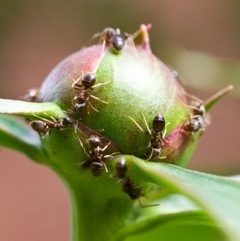 They obtain the honeydew by stroking the aphids with their feelers! On certain still, warm days each summer, males and queens will emerge from the nest and take to the wing, mating in flight. The queens then shed their wings and start new nests. The males, their sole purpose fulfilled (if they are lucky), die. Environmental cues lead to all the nests in a locality releasing their males and queens at the same time. This enables inter-nest mating, ensuring genetic diversity. 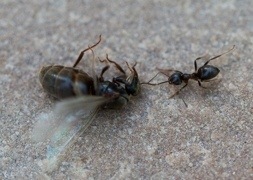 The study of ants is called myrmecology. This made me think of Achilles’ myrmidons so I looked up the etymology of the word and learned my new thing for the day! According to myth, Zeus made the Myrmidons from a nest of ants. Another meaning of myrmidon is a faithful follower who carries out orders without question. There’s a lot to be learned, so look around. He’s got high, apple pie, in the sky hopes. 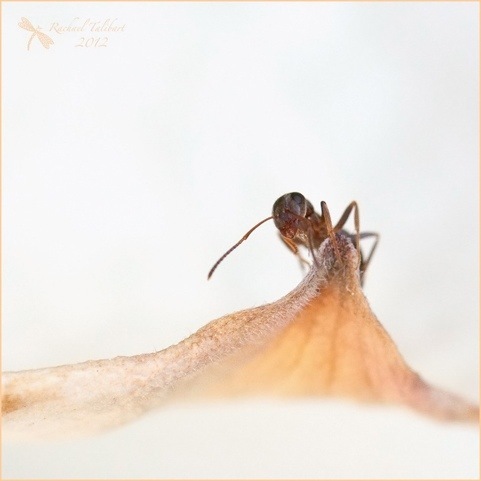 This entry was posted in garden, nature, photography and tagged ants, garden, garden ant, insects, Lasius Niger, macro, myrmidons, nature, photography by Rachael. Bookmark the permalink. Thank you very much. I am glad you like them. Nice post Rachael and great facts and photos. We have a few of them who have decided they prefer to congregate in our conservatory than outside at the moment. Oh fun! Thanks, Karen. When we moved in here the living room was infested with them. I probably shouldn’t say this but Raid works, instantly and permanently. I think my favorite shot here is the very first. We don’t have many really nasty crawly things here… But we also don’t have any sunshine, so maybe not… ;). I was pleased to have an excuse to blog the lyrics from High Hopes. My dad, a Sinatra fan, used to sing it to me when I was a child. You have a real talent for combining word and image, Rachael. The information about the word myrmidon was new to me and I love how you wrapped up the whole photo essay with the lyrics from High Hopes. Thank you so much! I am having a lot of fun with this project. As I can’t use my camera as much as I would normally (although I am having a better week so fingers crossed! ), I am enjoying revisiting old images and adding my love of writing to the mix. Occupational therapy.